The fire engine after it crashed into properties in Larne. Picture by PressEye. 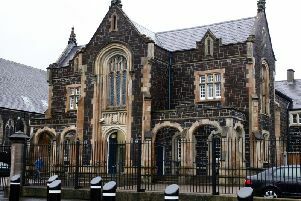 TWO Larne men charged with taking a fire engine and leaving behind a trail of destruction to houses and cars in the town totalling “£1.5 million” have had their cases sent to the Crown Court. Robert Duffin (66) and Ross Clarke (19) appeared at a preliminary enquiry at Ballymena Magistrates on Thursday. They are charged in connection with the alleged rampage on March 5 this year which created headlines. Duffin (66) originally of Green Link but now living at the Simon Community on the town’s Curran Road and Clarke (19), originally of Fairway in Larne and now at Drumcree Place, Rathcoole, stood side by side in court as a prosecutor submitted there was a case to answer. Both accused confirmed they were aware of the charges and said they did not wish to say anything at that stage. Defence barristers Neil Moore and Stephen Law said they had no contrary submissions and District Judge Peter King ruled the case should be sent to Antrim Crown Court with both accused released on continuing bail. Mr Moore applied for two counsel for Clarke saying the damage allegedly caused totalled “£1.5 million”. It was the first time the amount of damage has been mentioned in court. He added his client has “significant issues”. The charges now reveal the names of who had property damaged in the incident. Clarke faces 14 charges and Duffin eleven charges. They are both jointly charged with ten counts of criminal damage. The charges include causing damage to an articulated lorry belong to the BOC Group; damage to a house at 50 Glenarm Road and a Nissan Duke belonging to John Lashford; a Modus Renault belonging to John Kearney; a house and garden wall at 42 Glenarm Road and a Ford BMAX belonging to Marie Hamilton; a garden wall and garden at 48 Glenarm Road and a Peugeot belonging to Mary Maguire. The other criminal damage charges relate to damage to a Lexus belonging to Thomas Jobling; a Mazda belonging to Colin Gorman; a Hyundai belonging to Margaret Campbell; and a house and garden at 52 Glenarm Road belonging to Geraldine Connon. Both men are also both charged with causing criminal damage to Larne Fire Station at Agnew Street. Clarke alone also faces four more charges - attempted burglary with intent to steal at Victoria Road, Larne; criminal damage to two doors belonging to Ryan McDonnell of Travelwise Coaches; dangerous driving on roads between Agnew Street and Glenarm Road in Larne; aggravated taking and driving a fire engine in that before it was recovered damage was caused to the vehicle. Duffin alone is charged with aggravated taking of the same fire engine and allowing himself to be carried in the vehicle and that before it was recovered damage was caused to it. Earlier this year a court was told a Volvo fire engine was allegedly driven by Clarke who has a “severe learning disability”. It was alleged by Neil Moore at a March hearing that Clarke had never driven a vehicle before and that accounted for him trying to reverse the engine back into Larne Fire Station at Agnew Street and crashing into a wall and causing severe damage. At that court there were also claims that at one stage the driver was told not to go down a street because it was one-way and on another occasion the fire engine stopped at red traffic lights. During the alleged rampage the fire engine careered out of control at Larne’s Glenarm Road causing damage to the vehicle, the fire station, vehicles and dwellings. The emergency vehicle’s flashing emergency lights were on when it was found embedded in the front of a house. A police officer told the March court Duffin had a “fascination with blue lights”. Stephen Law told the March hearing the destruction caused was like a trailer for the next ‘Hangover’ movie. A police officer told the March court he believed Clarke was driving the vehicle. He said the area where the offences happened would be well-known to both the accused. The officer said in March there had been a “public outcry” in relation to the Fire Service cover in the area being reduced due to the damage to the stolen fire engine.